This one seems to be a case of keeping up with the Joneses. In 2013, the Royal Academy of Music Soloists Ensemble released a recording of Erwin Stein and Arnold Schoenberg’s chamber orchestra arrangement of Mahler’s Fourth Symphony (Linn SKD438), part of an ongoing project to revive the repertoire of Schoenberg’s Society for Private Musical Performances concerts. I haven’t heard that recording, but a later release in the series, of Bruckner’s Second Symphony, in a new arrangement by Anthony Paine (Linn CKD442, review here) proved a revelation, bringing new insights to the work and fully justifying both the arrangement itself and the recording. 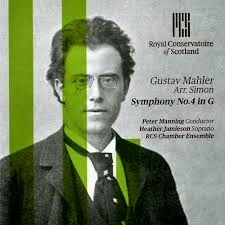 Now the Royal Conservatoire of Scotland is getting in on the act, with a very similar release, Mahler’s Fourth in a different chamber orchestra arrangement, one by Klaus Simon from 2007. The attraction of these arrangements for music conservatoires is clear; they are ideal showcases for the cream of their student talent, and if done well provide excellent publicity for the institution. It is not clear why Simon chose to make a further arrangement of the Fourth Symphony, given the enduring popularity of the Stein/Schoenberg version. But Simon’s too has been widely performed, and is published by Universal Edition, although this seems to be its first commercial recording. The only obvious change in instrumentation from the Stein/Schoenberg is that the earlier arrangement calls for two pianists while the newer needs only one. Despite this, the single piano part is particularly prominent in Simon’s version. It is heard clearly reinforcing the sleighbells at the start, for example, and in the coda of the first movement. The Royal Conservatoire of Scotland Chamber Ensemble is conducted by Peter Manning, better known as concertmaster of the Royal Opera House Orchestra, but also holder of a joint professorship at the Conservatoire and Edinburgh University. Manning uses the lighter textures of the arrangement as the basis for a fleet and agile interpretation, often faster than the norm, but never feeling rushed. The greatest benefit the arrangement brings is to highlight the many fine soloists of the ensemble. Violinist Gongbo Jiang is excellent in her every solo turn, as is horn player Enako Carroll. The soprano, Heather Jamieson, has a thin tone, not especially attractive but certainly expressive. The clarity of her diction is also impressive, making apparent how closely she ties her interpretation to the meaning of the words. The downside of this arrangement, at least as performed here, is the thin sound of the tuttis. The string quintet often sounds threadbare and lacking in bass, especially at the more emotive climaxes. More liberal deployment of the harmonium may have helped here. Poor tuning in the string ensemble suggests that the playing may also be to blame, and textures that should be warm and euphonious are often rendered less so by wayward intonation. It is still a decent performance, but hardly an outstanding one. The playing is serviceable, and the young instrumentalists to justice to Peter Manning’s dynamic interpretation, which emerges as the most exciting aspect of this project. If this is, in fact, the first recording of the Simon arrangement, then he and his publishers are clear beneficiaries, as are the conservatory and its players, particularly the soloists, for whom this is an excellent platform. Sadly, few benefits accrue to the composer, or to his audience, who can undoubtedly find many recordings, even of chamber orchestra arrangements, that are more exciting than this. This review appears in Fanfare Magazine, issue 38:6.